Ruth McAllister, SCN, 89, was born in Columbus, Ohio. She died at Nazareth Home, Louisville, Kentucky, on Feb. 8, 2019. She was a professed Sister of Charity of Nazareth for 67 years. Sister Ruth served in educational ministries in Louisville at St. Augustine and St. Frances of Rome; St. Mary School, Paris, Kentucky; St. Mary, St. Clairsville, Ohio; and LaSalette Academy, Covington, Kentucky. She served in the business office at Spalding University (then Catherine Spalding College) in Louisville. She also served in Pastoral/Parish ministry at Mother of God in Covington, Kentucky (1972-1980); St. Peter, Lexington, Kentucky, and Holy Family, Birmingham, Alabama. 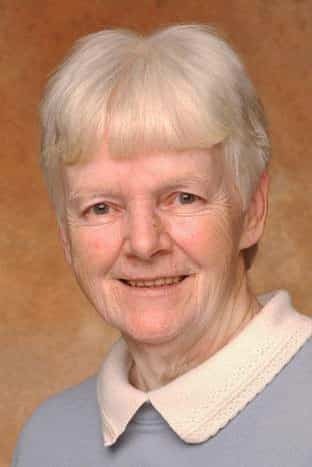 Sister Ruth served as the director of religious education at Berea College; Berea, Kentucky, St. Brigid, Vine Grove, Kentucky; and Holy Rosary, St. Mary, Ohio. Sister Ruth studied art full time at Xavier University for two semesters from 1994-1995. She served in community service at Nazareth from 1995-2015 and practiced art during that time. Sister Ruth is survived by her sisters Jean McFadden, Rose Marie Bigler and Judy Dennison; many nieces and nephews, and her religious community. Her Wake will be held Wednesday, Feb. 13, 2019, at 6:30 p.m. at St. Vincent de Paul Church, Nazareth, Kentucky. A Memorial Mass will be offered Thursday, Feb. 14 at 10:50 a.m. at St. Vincent de Paul Church, Nazareth, Kentucky. Visitation will held Friday, Feb. 15, from 10:30-11 a.m. at Mother of Sorrows Chapel at St. Joseph Cemetery, 6440 S. High St., Lockbourne, Ohio. Mass of Christian Burial will be at 11 a.m. with Msgr. John K. Cody presiding. Burial to follow in the family plot at St. Joseph.